Mochila bags seem to be the hot new trend. If you have seen these bags, then you know why! They are fun, stylish, and great to take to the beach, on a picnic, or just on an outing around town. Some Mochila bags are rather plain looking, but some sport an intricate and beautiful design. I wanted to design a bag that is sort of in between. Something that looks great, but isn't intimidating to make. Here is what I came up with. I made my bag with 100% cotton yarn. I like that cotton is a natural fiber, and I like the feel of it. I also think that it will wear better than an acrylic and hold up better in the wash. Note: We will be working in a round. I found it helpful to mark the first and last stitch of each round, and move them up as I go. When ending a round, we will join with a slip stitch to the first sc in that round. When beginning the next round, we will ch 1 and start our first sc in the same stitch as the joining stitch. To do a tr: Yarn over hook twice, insert hook in the indicated stitch, yarn over, draw yarn through stitch, [yarn over, draw yarn through 2 loops on hook] 3 times. With color A, ch 2.
skip 22 sts, join yarn to the next (23rd) st, ch 120, place stitch marker A in the next (24th) st and beginning with the marked stitch, skip 62 sts, sl st in next (63rd) st, place stitch marker B in the last (62nd) skipped stitch. Join color B with sl st to the stitch where stitch marker A is. Move stitch marker A to the unworked st next to it. Join color C with sl st to the stitch where stitch marker B is. Move stitch marker B to the unworked st next to it. Join color A with sl st to the stitch where stitch marker B is. Move stitch marker B to the unworked st next to it. Join color A with sl st to the stitch where stitch marker B is. Row 9: hdc in each stitch of strap. Join with sl st to the stitch where stitch marker A is. With colors B, C, and D, ch 135. Finish off. Weave the tie through the ch 1 spaces in round 72 of the bag. Knot both ends of the drawstring. You may make and attach tassels or pom poms to the ends of the drawstring, if you wish. What colors will you use to make this bag? Leave a comment and let me know! In reading through your pattern, you start saying "TR" beginning in rown27. I have no idea what that means... Please elaborate! Hi! TR is triple crochet. Actually I should not have capitalized it. I will fix that. Haha! Good thing there are tons of color possibilities right? Hopefully you don't meet any knife wielding thieves with your new bag! Love the little decorative pattern. Such a lovely touch. How big is this bag? Thanks! It is about 14 inches in height and 30 inches in circumference. The strap length is 38 inches. Yes. Three stitches down. Each stitch down is from a previous row... Ah! a previous ROUND. I will go back and change that. Thank you! I'm still a little confused. So you do 8 sc and then 1 treble crochet and repeat all the way around? Ok so I'm still a little confused. So on round 27 do I do 8 sc and then 1 treble and repeat until next round? I have seen your Mochila bag, but it is not Mochila. 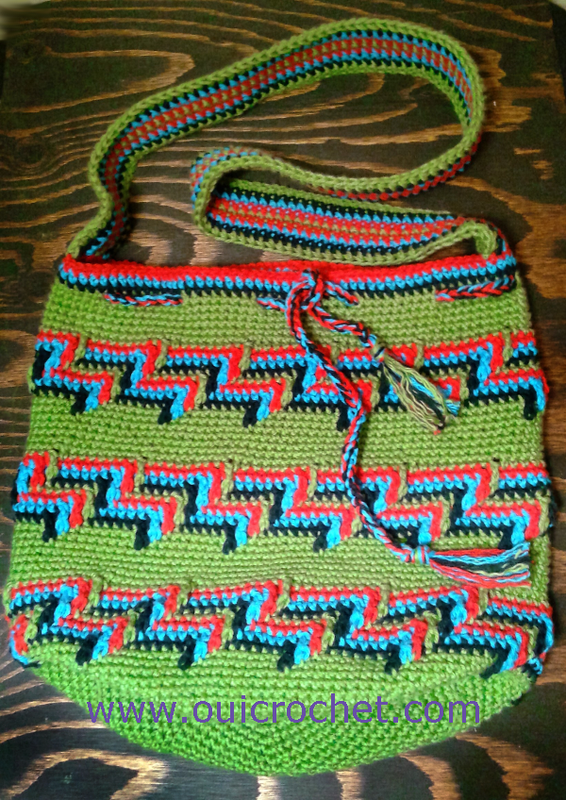 In the Mochila technology, crochet only back loop, never both loops. I just started making your bag. I have noticed that the bottom of he bag does not lay flat, is this the normal? I am on round seven and it is really beginning to "ruffle". Hi Peggy. It doesn't lay 100% flat, but it works out okay once the sides are built. You can also block the bottom before moving on to the sides, and that should flatten it out. If it is ruffling a LOT, then I'm not sure. It could be a difference in tension or maybe too many stitches? Not trying to burst your bubble but this is definitely not a mochila bag. It is very cute though. 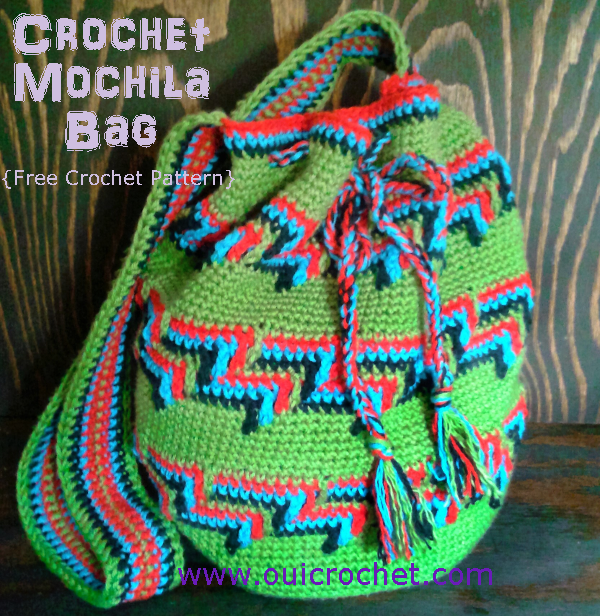 Mochila is only done in single crochet and back loop only. Plus they are made with size 3 or dk weight yarn. You carry your colors all the way through crocheting over them with the color changes. This is what gives it stiffness. Thank you, Anonymous, I appreciate your input. I have since addressed this in the article. Try reading the whole article before commenting. Beautiful! Thank you for the instructions. Your work is great! Great pattern! I love the sturdiness of the bag. I done mine in Rasta colors. Turned out gorgeous. I also reduced it a bit because I didn't want a bag that tall. But thank you for sharing. Thank you, thank you, thank you, I have never been so happy, I made a no hills bag but couldn't get to grips with the strap cuz I've not learnt how to make the cords! I can finish it off now and start a new one all thanks to you! that is a Mochila bag group on Facebook, it is run by a few ladies from over in Europe somewhere, I think The Netherlands and they spend their time helping the rest of us learn how to make these Mochila bags done correctly. Its a fun group and the ladies are super helpful. I thought you might be interested in checking them out. What are the dimensions of this bag when finished? I don't see that information above. Hi! It is about 14 inches in height and 30 inches in circumference. The strap length is 38 inches. How would this pattern work with the Mochila stitch of back loop only ? I love this pattern and was wondering if you mind me selling the backpacks that I make with the pattern? I will make sure to give you full credit for the pattern as well. Hi! I am definitely a beginner in crocheting and my daughter saw this bag and loved it. I want to attempt it and pretty sure I can do it but could you share with me your method of joining in a new color. Is it like other Mochila Bags where you are working more than one color all through the pattern? Thank you for any help you can give me! It really is a beautiful bag! The beauty of this bag is that you only need one color going at a time. When there is a color change, I simply switched to the new color at the end/beginning of the round, and finished off the old color. Just weave in the ends when you are finished, and you are good to go. I am already confused. I'm done with round 3. (18) Round 4 then calls for 2 SC in every stitch around. That would make 36 stitches around. I don't understand something. HELP!!! "Round 4: ch 1, [sc 2, sc 2 in next st] repeat around. Join. (24)"
Hi. So, sc 2, then sc 2 in the next st. Basically, you will be doing sc, sc, 2sc (in the same stitch). repeat. I actually figured out what I was doing. Lol. Sometimes I make things harder than they really are. Next question... Round 27... Sc8, tr in next st 3 does down... Repeat around. Comes out 3 stitches short. I end up with 104 stitches. What am I doing wrong? Glad you figured it out. Not sure what, exactly, is happening with round 27. It could be a couple of things. First, the stitch count is easy to lose track of if you don't use stitch markers. I rarely use them, but for this project, I made an exception. they just made life easier. lol If your count is ok there, then it could be that you are going a stitch over when you are doing your triple. After you get into the groove, it will get easier. I completed this pattern with Lily's sugar n cream yarn. Colors were orange, red, yellow and blue. I know I didn't do it correctly the pattern does not like your picture, however it did peak my interest in this style and I will be trying other patterns in this style. So thanks your pattern gave me something different to try and my daughter loves the bag. (She's my harshest critic) so thanks for posting. Hi! Just finished the bag, love it so much!! I used Premier Cotton in a natural off white for the main color and black, turquoise, and red for the stripes. Thank you for the pattern! Completed this project with Peaches and Creme cotton. I changed it a little but didn't take away the main pattern. The person I made it for loves it. Thank you for the pattern. I would post a picture but I don't know how to do that. Have a great day everyone!! On the rows of your color changes the green blue and orange when doing those rows do you carry each color through the entire round? Round 28 is giving me problems. When coming to the end of the round I'm ending up with doing the 7 sc. then I have one more stitch left. My understanding of the pattern the tr should be next to the last stitch. But the tc at the beginning of the round is not the second stitch from the beginning round. Therefore the ending is coming out off from the beginning of the round. What could I be doing wrong? Love your bag, and I have done the base several times to get it right, it still isnt right, but its a practice so probably will sort any mistakes with practice. With the instructions it says ring 6, then say up to the final row inc then 16 sts. It was very concave or convex depending on your point of view. then I doubled the increases and it seems much better. Wonder if I might be better with a smaller needle. Im using a 2.5 English hook. Also I have searched for the size and cannot find it. At this point I have 162 sts and diameter is 6IN (15.5CM). Thanks for your help. I have started this over and over and keep getting an octagon shape. What would I be doing wrong my stitch count is correct on each Round. I love this bag. But I am now confused. On row 27 when I do the TR 3 rounds down in front loops only I don't understand how that is possible. There are no front loops if the bag is worked in 2 loops starting round 20 and on. Please help! I can't figure it out. Thanks!